The events of this post happened between 12:00AM and 11:59PM on November 26, 2011. As a father of a 2 year old I often wonder what influence I am having on him. I want him to grow up with a sense of wonder and adventure. Always wanting to know what is behind the next hill. Always curious, and having the courage to explore his world and satisfy his curiosities. These past few days I have been seeing signs of how I am influencing him. We have been on a road trip for 4 days on a geocaching road trip to explore eastern North Carolina, and pick up some pages for the Delorme Challenge for North Carolina. We are a family of Canadians living in the US, and since this adventure is happening during Thanksgiving, and we celebrate ours in October, I have dubbed this trip: Geocaching Yanksgiving (it always helps to name your adventures - gives it a sense of purpose). Todays adventure hass brought us back west. We started the day on the Outer Banks, and ended up a hundred miles west, squarely safe on the mainland. The landscape has changed from ocean beaches, to swamp land, and to rich farmland. We've seen a lot of history, and a lot of cool nature. I've also seen Zeke take some more steps on his way to become an adventurer. Since the first day we left on this trip, Zeke has started each day excited to go caching. He would sit in his car seat and say "cache!" over and over in his cute little toddler voice. This is completely unprompted. We didn't start the trip saying we were going caching. He just seemed to know, and he got excited about it all on his own. Now when we pull up to a parking spot and tell him its time to go get a cache, he practically bounces in his seat. Today I had a couple of really cool experiences caching with Zeke. The first experience was the first cache of the day. We parked the car, and had a 300ft walk across a field to get to GZ, which was in the woods on the far side. When we got to GZ I spotted the cache almost immediately - it was an ammo can sitting under a pine tree, but I waited to see if Zeke would spot it. We walked into the woods a bit more and sure enough he spotted it. Without hesitating (and just a little prompting from me) he walked the 6ft father into the bush, crawled under the pine tree, grabbed the ammo can (which is half his size) and pulled it out so we could open it. Not bad for a 2 year old. I am really starting to look forward to the next few years as Zeke gets older and can handle more hikes and exploring further and farther. It is going to be a wild and fun ride. The events of this post happened between 12:00AM and 11:59PM on November 25, 2011. The sound of the pounding surf slowly invades your consciousness, bringing you gently from a deep sleep into the waking world. You keep your eyes closed, desperately clinging to the joy of a deep slumber. Other sounds begin to invade the peace and quiet of your mind: Your wife breathing deeply beside you. The stirring of your son in his crib across the room. The dog scratching in her kennel. Over then past few days we have travelled to the eastern coast of North Carolina. Seeking fame and fortune and geocaches as we explore the eastern half of the state we now call home, and claim pages for the North Carolina Delorme Challenge. Yesterday we made it to Kill Devil Hills, on the very eastern edge of North Carolina. We are in the middle of the Outer Banks, a thin strip of islands that stretch down the majority of the North Carolina coastline. Today we plan on exploring this thin sandy line, and see what interesting sights and sounds await us. The first location of note is a field in Kitty Hawk NC, the very spot where mans first powered flight was flown. There sits a National Park that memorializes Orville and Wilbur Wrights epic accomplishment. It is quite amazing to stand in the spot that made all modern flight possible. After Kitty Hawk, we drove south down the Outer Banks for a couple hours. Our strategy was to get to the end as quickly as possible to ensure we claimed the Delorme pages we needed, then cache our way back north to our hotel. The Outer Banks are a series of towns separated by long thin strips of sand dunes, sparse grasslands, and a lot of water on both sides. The landscape is broken from time to time with lighthouses, including the Hatteras Light House, the tallest light house on the eastern seaboard. I managed to pick up 11 caches today, including a webcam cache. We claimed 2 new Delorme pages. The pages are tall, and North Carolina is 4 pages tall. Since we are limited to a thin strip of land going north/south, we don't have a lot of pages. On the other hand, we have all of then Outer Bank pages claimed. We completely avoided Black Friday. Aside from filling the van with gas, we avoided purchasing anything. After spending a day on the Outer Banks I am ready to leave. Oceans and sand dunes are a nice change of pace, but I am definitely a trees and mountains kind of guy. Luckily tomorrow we head back to the mainland. ... crawling back into bed exhausted, you let your head hit the pillow. Closing your eyes and taking a deep breath, settling in under the covers, relaxation sweeping over you. The sound of the pounding surf lulls you into dreamland, bringing all the possibilities of the adventures tomorrow will bring. Stay tuned. The events of this post happened between 12:00AM and 11:59PM on November 24, 2011. We are on a road trip to explore eastern North Carolina in celebration of Yanksgiving, a fresh Canadian take on the American Thanksgiving holiday. We are also grabbing pages for the North Carolina Delorme Challenge. Last night we stayed in Morehead City, so it seems reasonable, baring some issue with the space-time continuum, that today would start in Morehead City, and you would be correct. We spend the day winding out way north eastward, exploring the inlets and roadways of the eastern North Carolina inner coastal waterways. Literally where the rivers meet the sea. Our first cache of the day was just outside of the town of Havelock, just off a little road, and 150ft into light woods. A perfect cache for the whole family. We parked about 400ft away and got Zeke and Bailey the wonder puppy out of the car. As soon as we started walking Zeke started excitedly saying "cache! cache!" over and over again. We wandered into the woods hand-in-hand (in the the manner that only a father and toddler are apt to adopt) and worked our way through the brush to GZ, where we were pleasantly surprised to find a rather large ammo can. Zeke loved exploring the contents of the cache. Like most kids the swag is his favourite part. We then headed back to the car, stopping along the way to pick up stones and explore the train tracks... typical toddler stuff. We eventually made it back to the van and got everyone settled. It was a perfect little caching moment, and a great start to the day. We turned the van northward and headed up to Washington NC, where we explored some cotton fields. Neither my wife nor I have ever actually been up close to a cotton plant so we took the opportunity to check them out first hand. Turns out a cotton plant feels exactly like... cotton. How predictable. From there we headed eastward through the marshlands that make up the western edge of Croatan Sound. There we hit a wall of mosquitoes as thick as a wave of Tie Fighters in Return Of The Jedi, and about as effective (annoying, draws some blood, but easy to kill). I have never seen so many mosquitos in one place before, and it turns out they were hungry and ready to feed. Apparently I taste good. I've often tried to get close enough to take a decent photo of them, and failed miserably, Today I got my best pics yet. Not outstanding, but not that bad either, if I do say so myself. The light house was our last cache of the day, so we crossed the bridges over Roanoke Sound and arrived at our hotel in Kill Devil Hills NC. After check in we enjoyed a wonderful Thanksgiving buffet in the hotel restaurant, a nice treat after spending so many hours on the road. I found 12 caches, none were suspended from trees. Only One was suspended (from fishing line). If there is a single person within 700ft of the cache, he will invariably be sitting at ground zero (happened twice today). If you look on a map of North Carolina you will see a long thin series of islands that extends almost the entire length of the state of North Carolina, shaped almost like a shield separating the ocean from the mainland. The long islands iare called the Outer Banks, and it is where we will be exploring for the next couple of days. The events of this post happened between 12:00AM and 11:59PM on November 23, 2011. A series of events have conspired to send me and my family on another geocaching road trip. Event The First: A while ago I convinced the wife (really it didn't take long) that we should attempt to do the Delorme Challenge for North Carolina. It involves finding a cache in all 77 pages of the Delorme North Carolina Road Atlas. We have all of the western half of the state, but only have a few of the eastern pages. Event The Second: Americans celebrate Thanksgiving at the end of November. We are Canadians who live in North Carolina, but we still hold onto some Canadian traditions, one of which being we celebrate our Thanksgiving in October. So when the end of November rolls around we essentially get 2 days free vacation to celebrate a holiday I refer to as Yanksgiving. So putting the math together, and adding an additional vacation day to the mix, we decided to celebrate Yanksgiving with a 5 day road trip to the eastern half of North Carolina to fill out some more Delorme Pages. We spend today driving across the southern half of the state to the coast, picking up 6 pages, and ending up spending the night in Morehead City NC. I found 9 caches today, including one of each of the traditional sizes: nano, micro, small, medium, large, jumbo. I found all the traditional hides (guard rail, fire hydrant, in prickly bush, behind sign) except LPC. Two of the containers were suspended in the air. I've only seen this 5 times, so its odd to see two in one day. Milestone Alert: One of the ammo-cans-suspended-in-the-air caches was my 900th find. ... before you get all panicky about the dangers about alcohol and fetuses, relax. The wine is non-alcoholic, and will be used over the holidays by said pregnant lady to enjoy without causing my unborn child to grow an extra arm in-utero. We actually ended up in Morehead City several hours ahead of schedule, so we decided to do a round trip to Cedar Island and grab the cache for that Delorme page. This page is tricky as there is only one cache on the mainland, and it is completely out of the way. Grabbing this cache adds several hours to our journey, so getting it out of the way now saves us significant time tomorrow. Stay tunes for more adventures as a family of Canadians celebrate the latest holiday craze. slightly off camera: proud daddy. What did you do on your lazy Sunday afternoons? As for me and my house, we chose to have an adventure. I have had my eye on some tricker caches in the area for a while, one being a tricky puzzle cache. On Thursday night I had solved the puzzle with help from fellow cachers weightman and idajo2. So with coordinates in hand I was anxious to get out on the trails and find the container. We get out of church at 11, and normally we head home for some lunch and napping. This past Sunday I talked my wife into going geocaching instead. So off we went to some parks in Hickory NC to tackle some caches. The first couple caches were along the Geitner trail, a paved path that weaves through a wilderness area The first cache on this trail was the puzzle cache mentioned above. It involved some bushwhacking, but luckily the coords were spot on. The second cache was further down the trail, and even more further down into a valley, 150 of bushwhacking on a slope. The cache was 45ft away from GZ so it involved some hunting around, but I eventually came up with the grab. Debbie and Zeke stayed up on the path and played. On the way back to the car, Zeke, ever looking for new sticks to play with, discovered the joy of Daddy's trekking pole (good thing I bought two of them! :). He actually got pretty good at using it correctly. The next cache was at Hilton Park, just a mile or so down the road. I have had my eye on this cache for a couple years now. I tried to grab it once before but I was unprepared for the terrain. The cache is called Hilton Wet Or Dry, because it offers you a choice: you can bushwhack to the cache over a half mile of bush (and this is North Carolina bush - chock full of thorny vines that would scare the devil himself), or ford a river that is 30 ft wide. Which would you choose? Myself I am picking the water. So with trekking pole in hand, and wearing freshly waterproofed hiking boots, I headed to the rivers edge and prepared to face my water nemesis. The river is not actually that deep, perhaps a foot and a half at its deepest, so simply wading across is an option - but to my mind that approach lacks finesse. So I slowly picked my way from river rock to river rock, and eventually made my way to the far bank and clambered up the sleep slope on the other side. The cache was about 150ft through the fine North Carolina bush, and quickly made the grab. Getting back was a bit trickier. For one I had to slide down the steep bank to get to the waters edge, and the rocks were spread wider apart. So it was touch and go for a bit, but with clever application of a trekking pole, utilization of low hanging tree branches as support from the banks, and some good old fashioned determination to not slip, I made it back across with out much incident. The toes of my boots got wet, but my feet inside remained nice and dry - not to bad if I do say so myself. I finished off the day finding the one other traditional cache in the park, then we headed home just in time for our afternoon naps. The Boy Scout motto is: Be Prepared. I was never a boyscout, but as a system administrator and geocacher I take that motto to heart. In my experience one is well served to put this to practice when one is on the hunt for a geocache. You never know what situation you find yourself in, so it really does help to Be Prepared. So as a service to any geocachers out there who may not find themselves entirely prepared, this post will outline the things I do to be prepared for any situation I may find myself in while out on the hunt for tupperware in the woods. Leatherman Wave multi-tool - I have built entire datacenters with little else than this tool. If you don't have one, stop reading and go get one now. 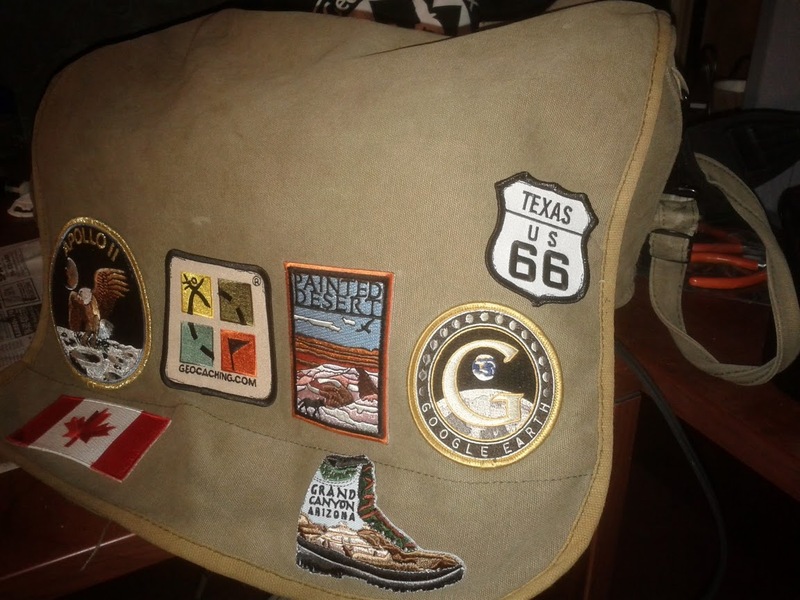 My geobag with badges from my various travels. A bag of ziploc bags - for replacing those ripped ones in cache containers that protect the logs. "I didn't sign the log because I forgot a pen"
So that is how I stay prepared. 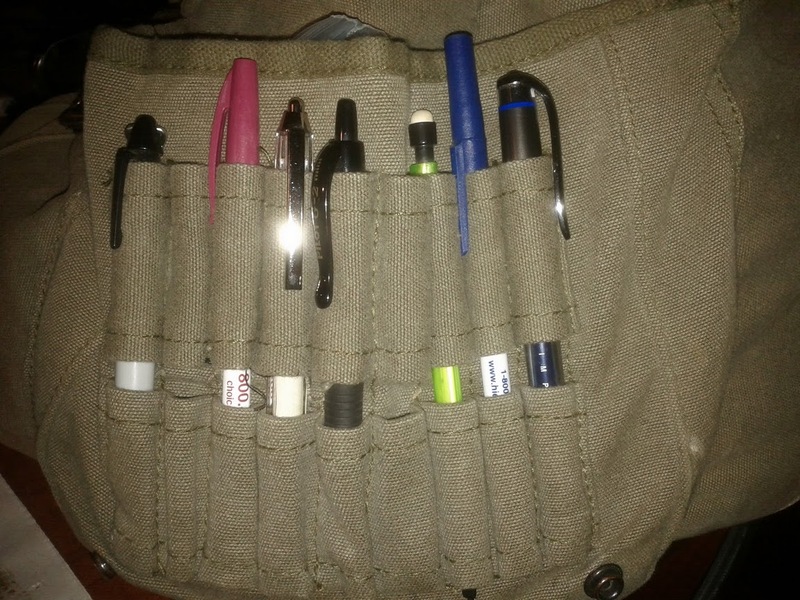 Did I leave anything out that you would carry on a geocaching hunt? Leave your suggestions in the comment section below. 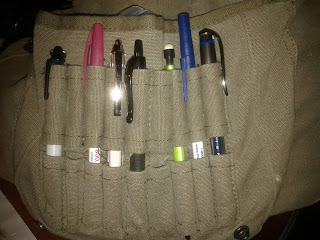 As an aside my geobag is also trackable on geocaching.com. 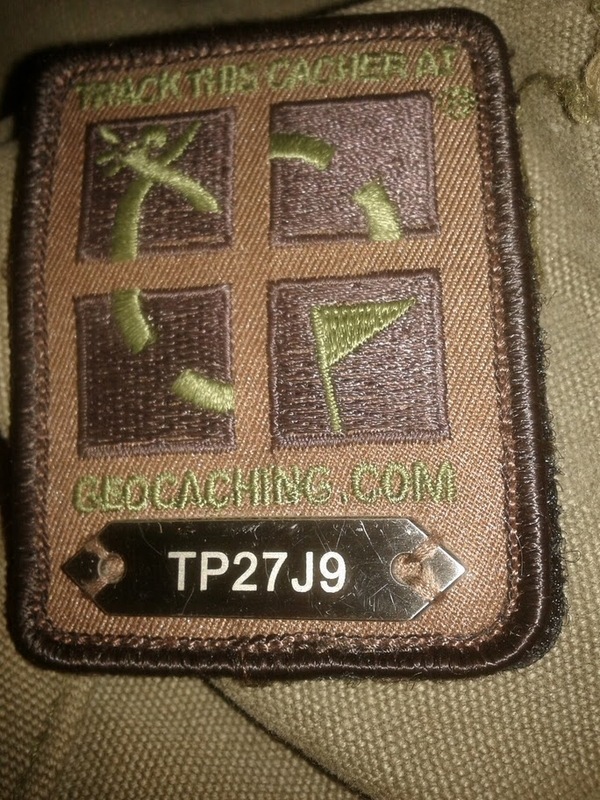 If you are so inclined, feel free to log 'debaere's geobag' at geocaching.com. There are many great things about being a geocacher: The thrill of the hunt, the adventure, exploration, being "in" on a secret... and sometimes it is the people. Over the past few months I have been interacting with several geocachers from South Carolina on Google Plus. They call their group the Band Of Cachers, or the BoC. I found out that they were holding a 11-11-11 event, so I quickly made plans to attend. Orignally I was going to go myself, but in the end the entire family made the 2 hour trek to Lancaster SC to attend the event. If you have ever met anyone who you've previously only known online you know that it is always a little surreal. To be in the presence of people who you know things about, but have not seen before takes some getting used to. However they did an amazing job of making us feel welcome, and it soon felt like we were among friends. The BoC are a great group of down to earth, decent folk with a great sense of humour. We spent the evening basking in the warmth of southern hospitality and geocaching bonding. Along the way I was initiated into the BoC by wearing a sombrero and having Happy Birthday sung to me by the mexican staff (did I mention that the event was held at a mexican restaraunt - if not go back and mentally read that in to the third paragraph - I'll wait). I hope to attend more events with these folks, and someday to go caching with them. All good things must come to an end, and this was no exception, so after the event we put an exhausted (1.5 hours past his bedtime, yet still amazingly well behaved) Zekey in the van and headed to the hotel to get some rest. * There was one cache that was hidden in a tree. The hider encouraged people to leave their personal marks by hanging their personal tokens on the tree. Its kinda like a shoe tree, but with previous finders trademark items. 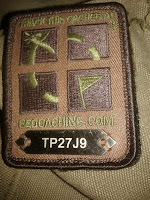 * I found 21 caches, a personal best. * Due to certain logistical issues brought up by caching with pregnant ladies and the resulting tiny bladder syndrome, I got to cache solo with Zeke for a couple finds. He enjoyed looking in the caches to see what trade items they contain, and wanted to trade for a plastic ruby necklace. I was a bit worried about that (as you can imagine) but my concerns were allayed when he spent the rest of that particular walk dragging the necklace beside him, kicking up dirt.